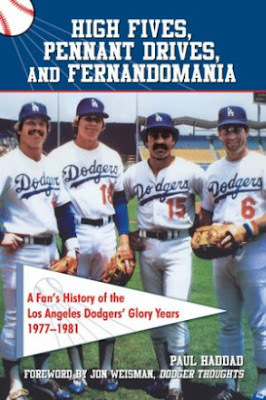 Book titled "High Fives, Pennant drives, and Fernandomania" hits the bookstores on March 1st. It's written by Dodger fan Paul Haddad and a foreword by Jon Weisman of Dodger Thoughts. For scores of Dodger fans, the years 1977 to 1981 mark the team’s glory days, and this sports compendium chronicles the highlights and disappointments that marked those four tumultuous seasons. Told from lifelong fan Paul Haddad’s perspective, the story of the Dodgers during this time period is enhanced by transcripts of radio and TV calls that are woven into the personal recollections, capturing famed Dodgers sportscaster Vin Scully at the top of his game. From Jerry Ruess’s no-hitter and Rick Monday’s epic homer against Montreal to the magical rookie year of Fernando Valenzuela and the 1981 World Series, all of the great Dodger moments are commemorated in great detail. In addition to its portion of the chronological narrative, each chapter contains lists, trivia, sidebars, and interesting statistics that make the exciting culture and fan frenzy that surrounded the Dodgers’ last great dynasty come to life.